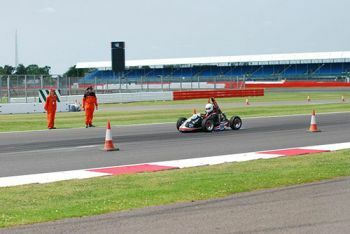 City Racing Team turns in a much improved performance at the Formula Student Competition in Silverstone which took place from the 3rd to 7th July. Competition, which took place at the Silverstone motor racing circuit from the 3rd to the 7th July. 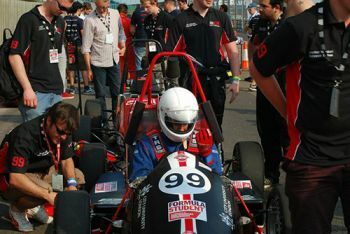 Organised by the Institution of Mechanical Engineers (IMechE), the annual Formula Student Competition is the world's largest student motorsport event. Aspiring engineers are challenged to design, build and race a single-seat racing car which is judged on its speed, acceleration, handling and endurance in trial races. The teams are also tested on several elements, including costing, business presentation skills and design. 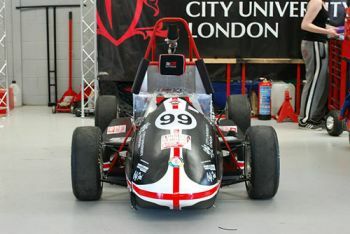 City's team and car, the CR13, was adjudged 15th overall among the UK teams. City Racing Team was also 24th overall in the endurance test and made the 19 car Parade Lap. The competition was won by the team and electric racing car from ETH (Swiss Federal Institute of Technology) Zurich. City's 15-person team and car mainly comprised final year undergraduate and postgraduate Automotive and Motorsport Engineering students. The team's CR13 Yamaha R6 engine benefited from a number of improvements including a fully handmade durable aluminium intake system for the powertrain, and smaller bodywork sidepods. Despite temperatures approaching 30 degrees Celsius, hundreds of people turned out to support the event. "I was delighted to see our City Formula Student team perform so well this year. We surpassed previous years, passing the first-round scrutiny tests among others. I am pleased that the team has also moved up the rankings considerably in all aspects to 15th overall in the UK - a well-deserved position. I was struck by the team's confidence and coordination. As soon as they encountered a problem, they solved it collectively and in the shortest possible time without asking any of the staff. This also reflects excellent learning outcomes both in knowledge and practical skills. I would like to take this opportunity to congratulate them whole-heartedly and wish them all the best in their future careers. Well done City Formula Student team!" "Amongst the UK universities, City placed 15th out of 33 - in the top half - which is a big improvement. We were also 1 of only 19 cars to make it into the Parade Lap around the circuit on the 5th July, an event all competing cars strive to be in. We can hold our head high when it comes to giving our Automotive and Motorsport Engineering students a complete all-round education. This extends beyond their excellent display of team-work, camaraderie and technical skill at Silverstone this year; the students are equipped to confidently speak to and work with any automotive engineering manufacturer. We are grateful for the support we received from a number of sources this year, including Caffe Fiori in Northampton Square". Find out where City can take you with a degree in Automotive and Motorsport Engineering.